I was hired as the first and only designer on the team to work closely with developers to build out the Cronologics operating system. This project consisted of researching, designing, prototyping and at times doing front-end coding to create marketing landing pages. Being the only designer at a small startup taught me a ton of valuable lessons. Most importantly, I learned how to collaborate with the CTO, CEO and all of the engineers to build the best product possible. It’s a watch first and foremost. 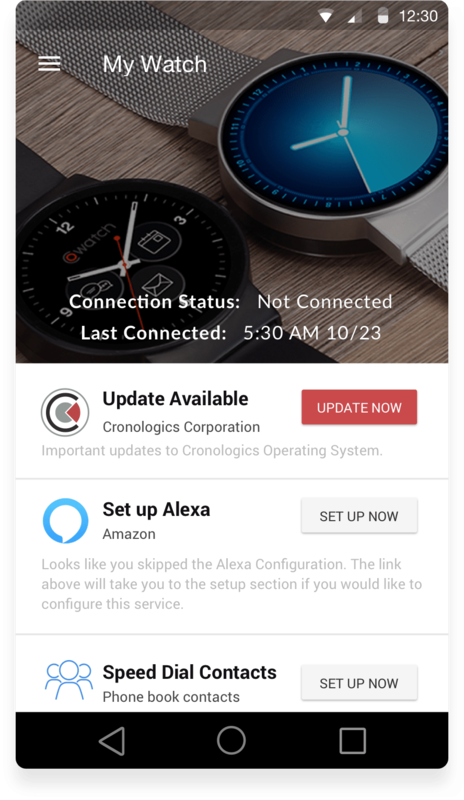 Cronologics enables high-quality, brand specific, customizable wearable products within a scalable Android-based architecture. What if your smart watch software worked on the hardware of the biggest watch brands like Rolex, Breitling, Omega, Cartier, Fossil etc.? The Cronologics operating system aimed to partner with watch brands to bring technology to traditional watches.The lack of innovation in traditional watch brand hardware should not limit today's modern day watch user. How might I improve the way that people know and trust their smart watch? We made an effort to speak to a large audience of traditional watch enthusiasts & iWatch, Android wear, Fitbit etc. more technical individuals, to see how we might be able to bridge the gap of old fashioned look and feel with the modern day connected world. Being able to bring the best of both worlds together was an interesting exploration task. Through some user research, we found out that the traditional watch hardware was still very much appealing to the average person. However, with the recent saturation of smart watches in the marketplace, people also wanted their smartwatch to connect to their social media channels, emails, calendars, fitness trackers and more. Maintaining the authentic watch look and feel was key to a healthy balance between hardware and software. The question is not what can we build, but rather why should we build it? Nearly anything is possible in software design. We spent a lot of time trying to figure out if the most appealing smart watch ui was a traditional skeuomorphic look and feel or the more digital flat/modern ui that is commonly seen on iWatch, Android and other devices. A healthy balance between the two seemed to make most sense to our potential users. Versatility is key. Let's face it, if a watch's interface and industrial design do not look great or are not versatile enough to match different outfits and scenarios, they will most likely end up in a drawer for weeks at a time. While looking around me at the different accessories that people had on, it struck me that people express themselves through the things that they wear, yet not every operating system or hardware device accommodates to every user. I would frequently strike conversations with random individuals at Bart, coffee shops, restaurants etc. to discover patterns and reveal unknown insights and preferences from the people who use similar products. 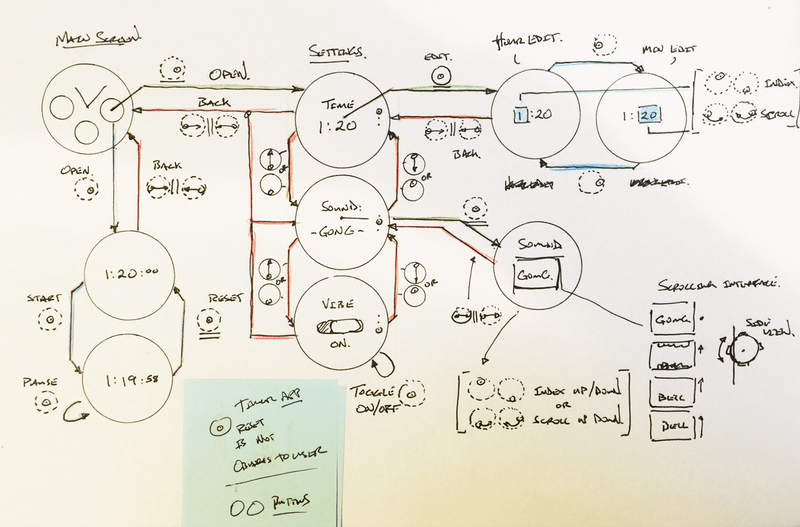 Doing this provided a deeper understanding of context for our design-thinking meetings. Having answers to these questions also allowed the team to focus on key interactions that would delight the end user based on quantitative and qualitative data. What would compel you to want to wear the same watch on a daily basis? What are the apps that you use on your phone that would be better suited on a watch? How long do you expect the battery to last on a smart watch? How do you feel about adopting a smart watch without needing to connect to a phone? 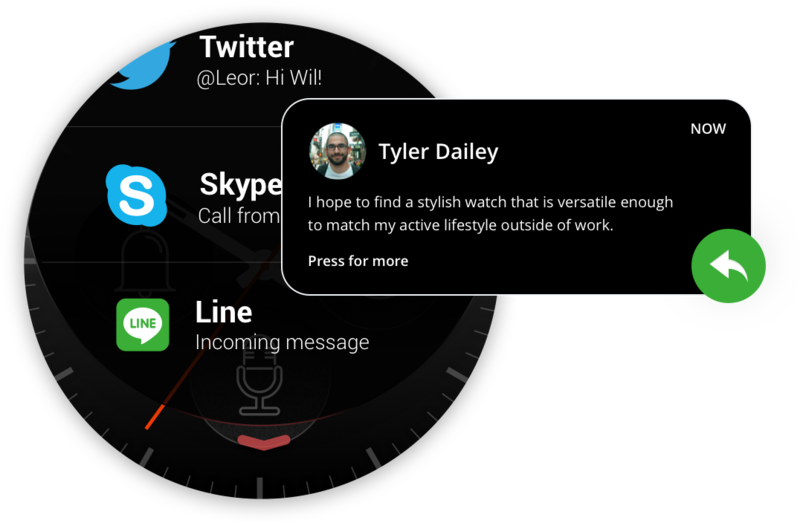 How do you feel about being able to receive notifications based on your environment via your watch? How often would you customize your watch face if you had infinite selections to pick from? “I hope that smart watches will become smart enough to notify me of the things that are appropriate based on where I'm at and what I'm doing”. I've had issues with smart devices going off at the wrong times. At times, during important meetings while in the office and other times while hanging out with friends. I hope to keep my work/life balance at a healthy level. This means, not being bothered by work emails while I'm out and about with family and friends. “Being able to glance at my watch while cutting hair is key to being efficient, while staying up to date with my client appointments”. Managing my schedule can be hectic while being at work.  I need to manage clients, quickly reply to messages and rearrange appointments on the fly. But I don't have an iPhone so I cannot get the iWatch. I hope to find a stylish watch that is versatile enough to match my active lifestyle outside of work, while also being useful with long battery life. “I love my Breitling watch. Although, it's a shame that they don't have a smart watch version with the same industrial design”. The traditional watch look and feel is the main reason why I wear watches, but because of this I miss out on notification at a glance, my favorite apps, and quickly changing my watchfaces depending on my mood. For my next smart watch, I look to get the old fashioned look and feel with some technology combined. Mainly because smart watches today are not watches, they are little computers on our wrists. Who do you relate with most? Are you like Jonathan who uses watches mainly to tell the time, but is desperately looking for a more sophisticated watch that leverages the old school look, with the magic sauce of todays advances? Or are you like Jamie who has already adopted a smart watch, but is looking for a better solution to notifications overload? Or both? Either way, I designed a solution with users like you, Jamie, and Jonathan in mind. Now that we have a better understanding of who I’m designing for, it’s time to move on to the good stuff! This watch is meant for those who have the need for only two things in a smart watch or device. It's designed for health and fitness & has a stylish look and feel for different environments. Like many Apple products, the iWatch has a "unique" look and feel that is combined with innovative new technologies that help you manage your apps, calendar, health and more. This version of the Samsung Gear is specifically targeted toward individuals with very active lifestyles as you can gather from the raged look and silicon straps. Minimizing the amount of steps to get a job done requires deep understanding of user behavior, market research and operating system limitation. While selecting the primary, secondary and tertiary gestures on the OS, we looked for easy ways to delight the users, with battery limitations in mind. No micro-interactions meant the users get bored, and too much animation meant sacrificing battery power. While other competitors pride themselves on how deep into numerous actions a user is able to go, the Cronologics OS is built on top of a minimalistic foundation. Getting the user from point A to point B, could not be any easier as you can see from the user flow below. Doing so allows the user to not only access their apps quickly, but also allows the watch to be what it's mean to be, a watch. The apps on the OS are called "containers". 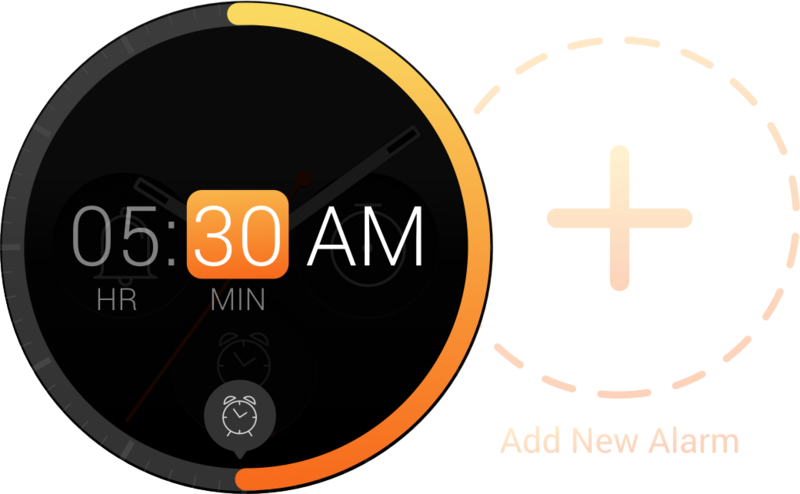 A user can easily access their containers by swiping left or right from the screen launcher (watch faces) or they can access all of their containers through the app drawer. Containers also have their respective settings, which allows the users to customize notification settings, customizations etc. Some of these settings can also be edited on the companion applications for iOS & Android. View the full version of the Cronologics operating system interactions and functions. 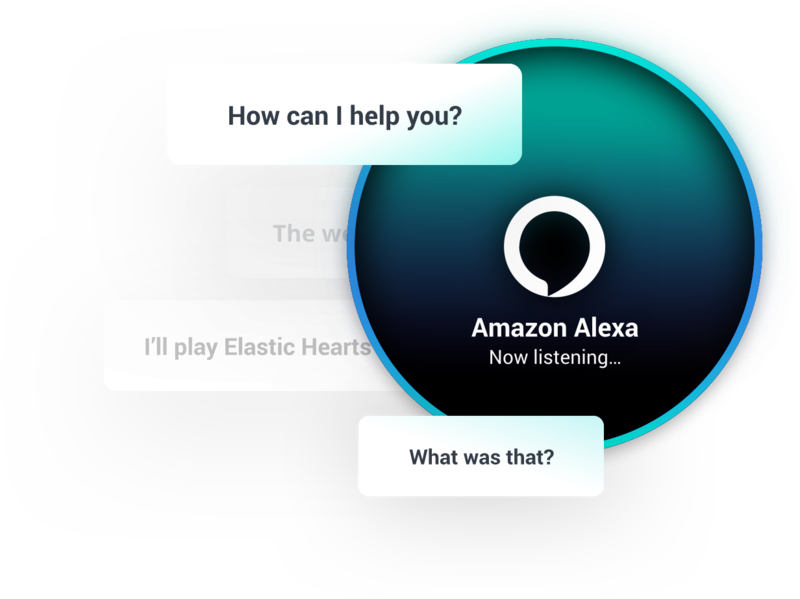 A digital assistant that can respond to a variety of queries and can respond to commands via voice or text depending on if a speaker is available. There are many types of notifications across iOS and Android. 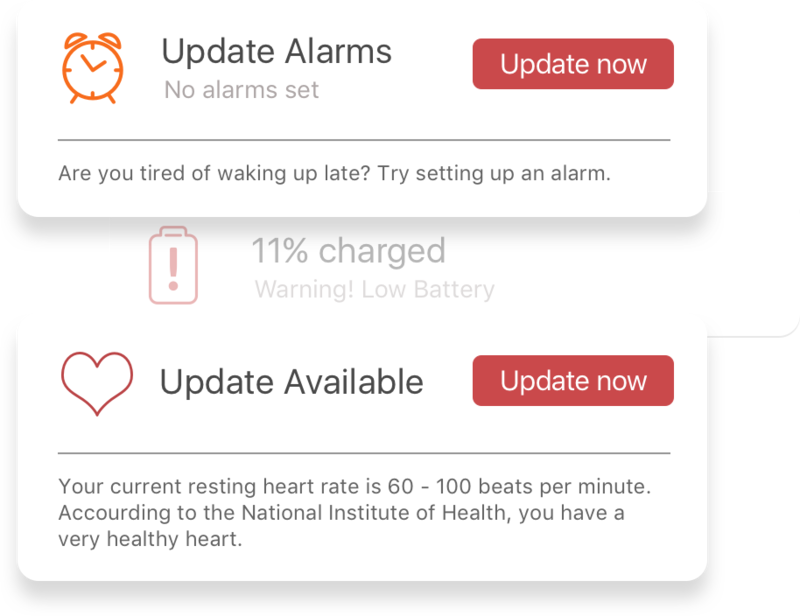 In general, they will be laid out in a similar paradigm with the main difference being whether actions are shown at the end of the notification. Notifications received recently will be displayed full screen first in the UI, followed by the list of all available notifications. Display the current number of steps for the day. 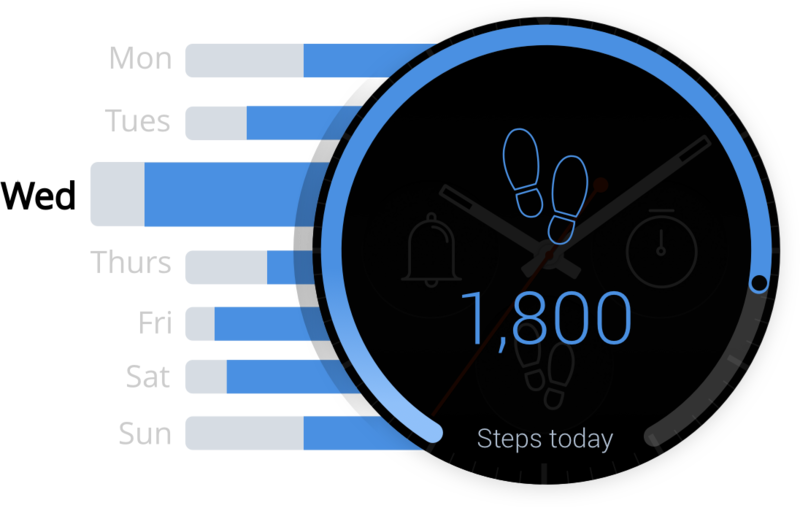 End User can configure their target number of steps per day in the settings. Set local alarms on the watch. Eventually, we will allow for customization for if the alarm is vibrate only or sound as well if a speaker is available. 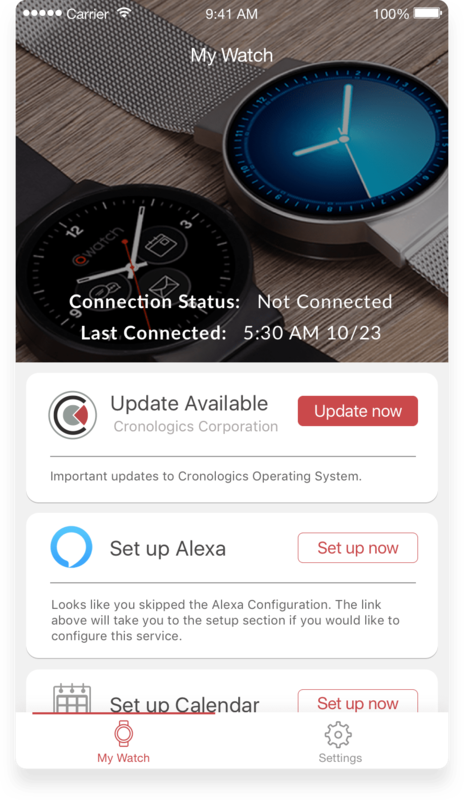 The Cronologics OS seamlessly connects to your iPhone device through bluetooth. Through the companion app, the user can further customize their micro app "containers". Updates are also available over the air. The Android companion app is capable of doing everything that the iOS app is. The goal was that an operating system that works on both iOS and Android will have a higher adoption rate than if they were soloed. This way, your family and friends can also convert to the Cronologics OS seamlessly. "To be at the cutting edge of innovation meant for myself and the team to be relentless. Luckily the founders cultivated a culture that allowed everyone to try new ideas, even if it meant potential failure. As long as we learned, together". I worked with some of the smartest people I've ever worked with on this project. Both the CEO and CTO worked at Google for a decade prior. The engineers worked day and night to build a product that functioned well. As the only designer on the team, it is my humble opinion that what we did best was, lazer focus communication in every meeting to establish that we were putting all of our efforts in the right areas. I primarily worked closely with one engineer who had interaction design experience from his masters degree at MIT Media Labs. I believe that designers should sit side by side with engineers because it ensures that the designs are not only creative, beautiful and viable for the business but also feasible for the engineering team to build. Having trust in the team was also very helpful during the rough times. I didn't know how we were going to do it, but we had a "get it done well" culture that really helped keep everyone focused. When I was brought on the team, I was trying to quickly understand the goal of the project. There were a lot of efforts in hardware, software and the right tools to invest in. One of the main things I would change in the early stages is more focus on the hardware limitations so that all of the designs get built. For example, some micro interactions were not able to go in the first build due to the fact that they would negatively impact the watch battery. In addition to technical limitations, another item that is worth mentioning is user research. As a tech startup, it can be very easy to neglect the obvious, which is building something for the end user. I felt that at times I focused more on what was easier to build than on creating the best experience possible. From my experience, working on teams that are heavily influenced by engineering, it can be tough to find your voice. It requires being brave and stern. I wish that I was a bit more aggressive.